So, while I like Google Play Books, I would like another option with a little better library management. It has to have good syncing so iBooks is definitely out. I did a search and came across a Wikipedia article on comparing iOS book readers. There are a lot more than I thought! The one that caught my eye was Marvin. Location syncing with Dropbox, using Calibre as a book manager (which I do anyway), Collections, annotations, themes, paragraph spacing (why is this omitted from so many readers? ), swipe-brightness control, swipe-temperature control, and a whole lot more. You can even edit all the metadata and sync this back to Calibre. Including book covers. It has more. 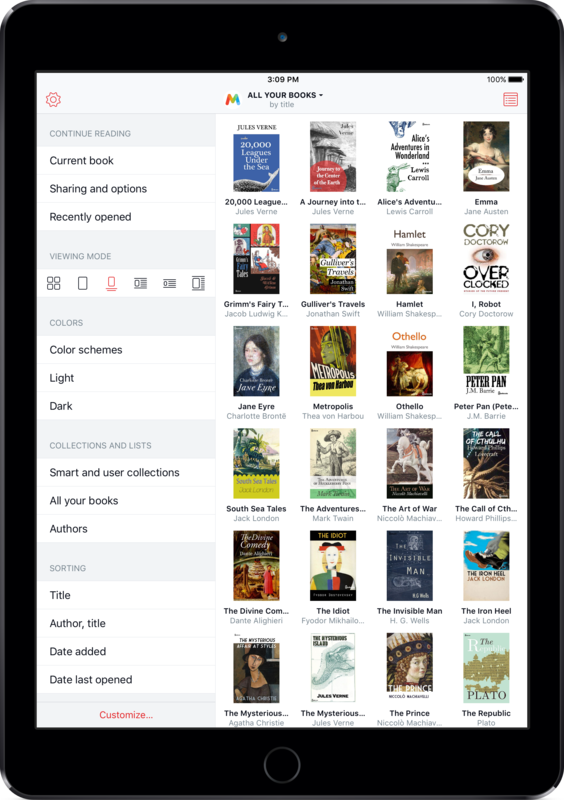 A “Deep View” action will intelligently scan your book and extract names, places, and so on and generate an index on the fly. It will store words you look up in the dictionary so you build a vocabulary list. Custom actions (at least on the iPad) that look like you can leverage URL schemes to link into many other apps and web sites (e.g. search for images), downloading from OPDS servers (Calibre has one, but there are also others where you can download non-DRM books straight off the Internet)… and oh so much more. It’s not the ultimate reader for me yet, though. It doesn’t look like the annotations sync automatically like Google Play Books does, but there are two manual ways to do it, one is to run the backup task (which backs up books as well as annotations and bookmarks) or exporting the annotations via email. The latter seems better suited for transferring from device to device, since one click will import them again. It also only handles non-DRM ePubs, but I have already decided that is my go-to format, and Calibre takes care of any unencumbering and conversion tasks nicely. I would like to see wireless connectivity to Calibre, and not just hardwired/USB connections supported. I would ultimately like to see a reader that will index/search across my entire library (for reference books) but I think that’s possibly too ambitious at this point. The best I can hope for is that DEVONThink To Go will improve to provide an archiving and searching alternative/companion for ePubs, as well as PDFs. It’s $3, or less than half the price of a cheap eBook. I’ve had it with iBooks, mostly because of its insane destructive syncing scheme. Which isn’t syncing at all, is it? See my logic below. I want to read books with my two portable Apple devices, optionally with my desktop Apple computer. I want to highlight, bookmark or annotate in one device and sync to any or all of the others. This sounds like a job for iCloud, right? You know, the Apple-invented cloud service for you know, syncing? The iBooks developers haven’t got the memo. You see, iBooks use your iTunes Account to sync. So that means my wife’s independent library and annotations (on her multiple Apple products) are clobbered if I ever decide to sync collections and annotations. This is because we share an iTunes account to purchase apps. Note that it is quite possible to have a separate iBooks login and iTunes login at the same time – only on the Mac version of iBooks. There is no option to select the iBooks store account on iOS 7. You know, where you actually want that option. The final straw was when yesterday I clicked iBooks, and it came up with a message “Hey I notice you are using icloud@account.com to sync. Would you like to sync with itunes@account.com instead?”. I did not want to do so, therefore I selected “Cancel”. I watched as iBooks then deleted a book that I previously synced with my iCloud account. I stand agape. I boggle. In what universe should “do not sync” ever change anything, never mind delete? iBooks is fundamentally damaged. 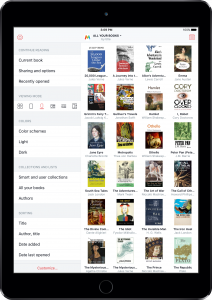 So is the iOS eBook reader ecosystem because of its mere existence. I have had enough.